I love tomato sauce. I could honestly eat it straight, but I don’t think that’s normal so we won’t discuss that any further. I had an idea after having a spaghetti craving, that I put into motion. I ended up pairing it with baked chicken breast and it went over very well. 2. Continue to “peel” vegetables over large sauce pan, making ribbon like bits of carrot and zucchini. 3. 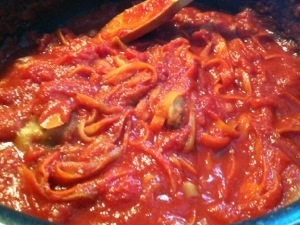 Add in can of diced tomatoes, tomato sauce, water, garlic salt, salt, and pepper. 4. Simmer on medium heat for 15 minutes, stirring occasionally. 5. Reduce heat to low and allow to simmer another 10 minutes, still stirring occasionally. Enjoy with pasta or quinoa, over chicken, beef, or even ground turkey!